Breakfast for 2. Full Kitchen. 3950 Koval Lane | A stay at Holiday Inn Club Vacations at Desert Club Resort places you in the heart of Las Vegas, within a 10-minute walk of High Roller and Sands Expo Convention Center. This hotel is 0.4 mi (0.7 km) from LINQ Promenade and 0.9 mi (1.4 km) from Fashion Show Mall. 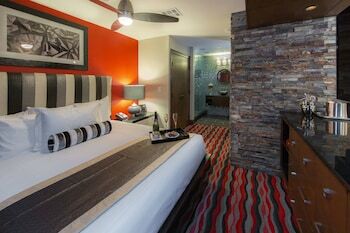 Make yourself at home in one of the 658 air-conditioned rooms featuring fireplaces and flat-screen televisions. Rooms have private furnished balconies or patios. Wired and wireless Internet access is complimentary, while DVD players and cable programming provide entertainment. Bathrooms with separate bathtubs and showers feature deep soaking bathtubs and complimentary toiletries. A stay at Holiday Inn Club Vacations at Desert Club Resort places you in the heart of Las Vegas, within a 10-minute walk of High Roller and Sands Expo Convention Center. This hotel is 0.4 mi (0.7 km) from LINQ Promenade and 0.9 mi (1.4 km) from Fashion Show Mall. Dip into one of the 5 outdoor swimming pools or 5 spa tubs and enjoy other recreational amenities, which include a 24-hour fitness center. Additional features at this hotel include complimentary wireless Internet access, concierge services, and an arcade/game room. Hop aboard the complimentary shuttle and get to the casino or shopping center in no time. Satisfy your appetite with American cuisine at Joes Gold Mine Bar Grill, a restaurant which features a bar. Dining is also available at the coffee shop/café. Full breakfasts are available daily from 7 AM to 11 AM for a fee. The preferred airport for Holiday Inn Club Vacations at Desert Club Resort is Las Vegas, NV (LAS-McCarran Intl. ).